Retired Navajo Ranger, Lt. John Dover still Inspects the unexplained. With this story, keep in mind that we really do tell it like it is- even when it is hard to believe. There is a law enforcement agency in Arizona that actually welcomes claims of the paranormal - ghosts, witchcraft, UFOs and even Bigfoot. CBS 5 obtained hundreds of photos and dozens of cases - strange scenes and sightings in northeastern Arizona. Only one agency - the Navajo Nation Rangers - stepped up to the plate. For the first time ever, they are sharing their documents exclusively with CBS 5 News. 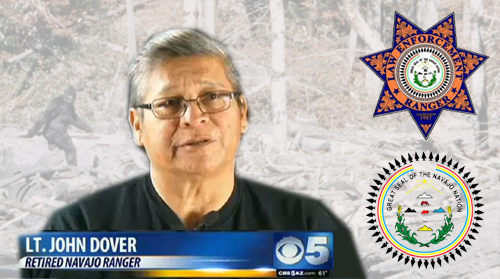 Retired Lieutenant John Dover explains that Navajo Nation Rangers are a federal law enforcement resource. They manage national parks, archaeological sites, fish and wildlife services and more as officers of the law. Dover spent 31 years in police work- the last 10 included claims of the paranormal. In one of the most solid cases, a mother and daughter describe a mass of lights floating over uninhabited reservation land in January 2012. As they watched, the lights blinked out after a few seconds, followed by a sonic boom, a black domed craft and the entire town of Chinle losing power. Their drawings are strikingly vivid - blue, orange and white colors stand out against a dark landscape. One case Dover investigated had 30 witnesses. "We came out with physical evidence," he said. "Hair samples, footprints, stride distances, logs that had been pulled out of the bog area and removed - normal people wouldn't have been able to do that." Dover retired from the Rangers last year but still consults unofficially on the side. The Rangers continue to take paranormal reports. "The cases are coming from people that are just normal people who were very afraid - something unusual was happening to them," he said. "They didn't know what was going on, they didn't know if it was military, something supernatural, if it was witchcraft. They wanted answers and they wanted to know that somebody cared enough about them to find those answers for them."